Sandwedge is a small condo complex in the Ocean Drive section of North Myrtle Beach, two blocks from Main St and two blocks from the beach. Enjoy the Ocean Drive Difference by starting your vacation immediately upon arrival, as this property comes with fresh bed linens/bath towels, the beds are already made up for you, and the departure maid service are all included in your price. Warm and inviting decor greets you as you enter this classic two-bedroom condo. A fully equipped kitchen, washer and dryer, cable TV, and outdoor pool and hot tub are a few of the great amenities that make Sandwedge a wonderful and affordable choice for your vacation. Best of all, Main St shops and restaurants are within walking distance, and the beach is just down the road, a short stroll away. 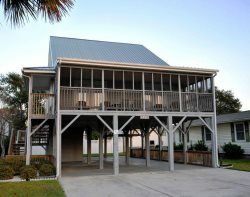 Rent this condo for your family vacation, SOS event, or winter residence. Also, take advantage of our Endless Fun Club, the exclusive discount program for guests of Ocean Drive Beach Rentals!